Let me start by saying when you're a red head, as I was growing up, you are limited in the colors you should wear. Certain colors just aren't flattering on a red head. It's something I learned to deal with over the years. So, when a friend gave me some brightly colored coral knit, my first instinct was to use this fabric for someone else. Certainly, I could not wear such a color. But, after some contemplation, I decided there was enough to try making a top for me. This friend told me that she'd had the fabric for 20 years and could hang onto it for another 20 years but she knew I'd make something out of it. She was right, of course. But the coral needed something to calm the color down a bit. So while looking through my refashion pile, I came across a lace valance that once accented the window in my daughter's bedroom. 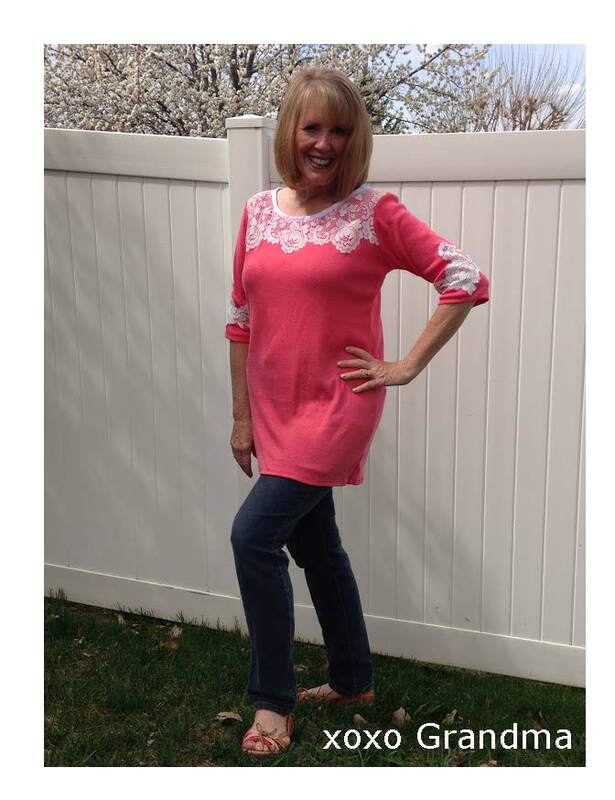 This lace seemed a perfect choice for a spring look. - I cut two groups of flowers from the lace valance. 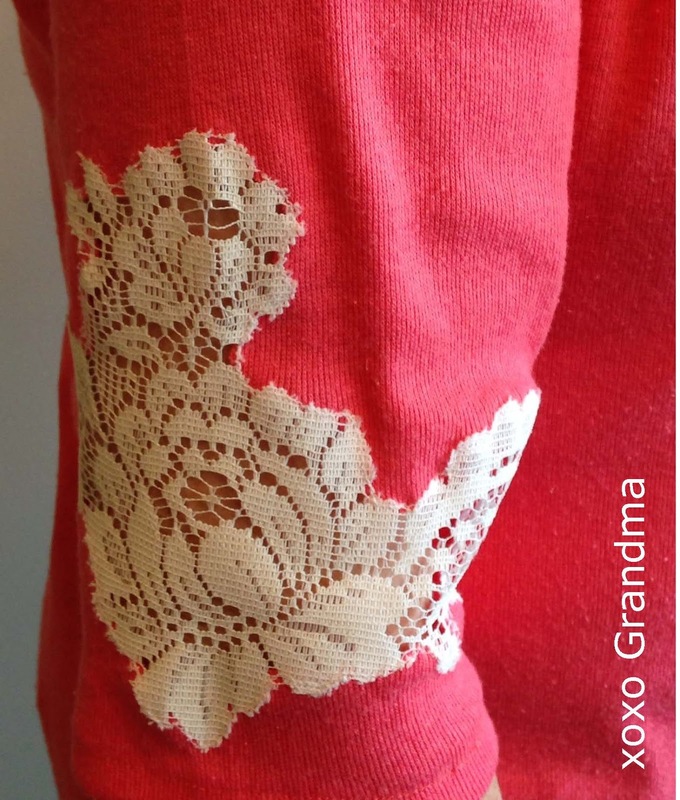 - Using a very narrow zip zag stitch, I sewed the lace pieces onto the lower center of the elbow length sleeves. - With sharp scissors, I cut out the coral fabric, creating a little "peek-a-boo" to the skin look. -For the bodice, I centered the bottom edge of the valance to the top portion of the bodice. After pinning the lace in place, once again I used a really narrow zig zag stitch to attach the lace onto the bodice. Once all the lace was added, I sewed the top together. Total cost of the project = zero. Pattern: taken off a favorite winter top. Since the top was free, I did what any sensible woman should, I purchased a new pair of shoes to go with it. A woman who makes their own top deserves a new pair of shoes, right? 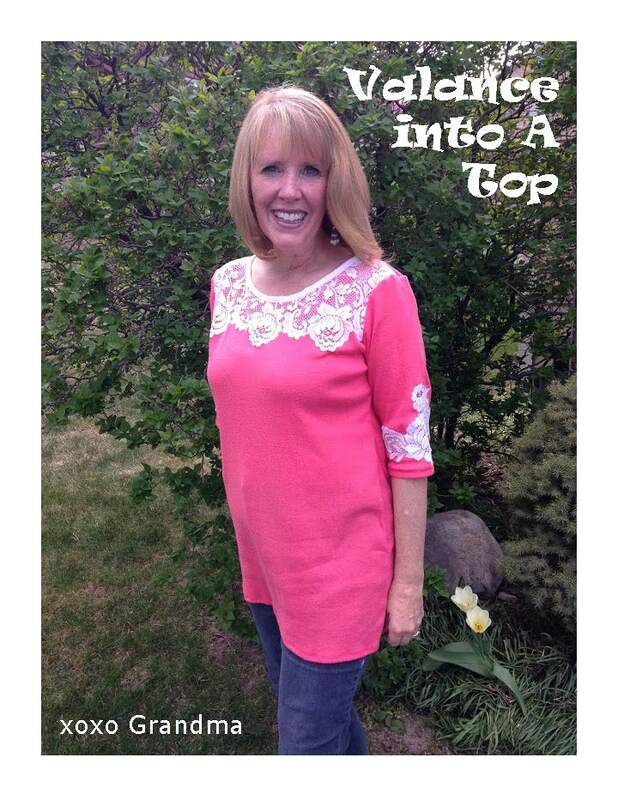 I think the lace adds a touch of vintage to this top, don't you? NOTE: This top was the winner of Week 3 Hint of Vintage on Skirt Fixation. Thank you to all those who voted for this top!